Hide this Project (Gaur Cascades) Discover properties in other projects by hiding the ones that doesn't interest you. You won't see them in your searches further but you can unhide anytime later. Hide this Dealer (Unihomes)Discover properties by other dealers by hiding those whom you have already spoken to. You won't see them in your searches further but you can unhide anytime later. Hide this Dealer (Harsh Associates)Discover properties by other dealers by hiding those whom you have already spoken to. You won't see them in your searches further but you can unhide anytime later. Hide this Dealer (The Stars Group)Discover properties by other dealers by hiding those whom you have already spoken to. You won't see them in your searches further but you can unhide anytime later. Hide this Dealer (K2 properties)Discover properties by other dealers by hiding those whom you have already spoken to. You won't see them in your searches further but you can unhide anytime later. Built in Raj Nagar Extension, Ghaziabad, Gaur Cascades is a residential development by Gaursons India. The project is sufficed with all modern amenities and covers 2BHK, 2.5BHK, 3BHK and 4BHK apartments. Being close to all necessities, it has good connectivity to the rest of the city. Raj Nagar Extension is located on the Delhi-Meerut road (NH-58). Ghaziabad?s real estate is witnessing growth as the city is offering beautifully designed affordable housing units. The residential projects are strategically located so that traveling and accessing commercial zones is hassle-free. What is the location of Gaur Cascades?The location of the project is Raj Nagar Extension, Ghaziabad. What apartment sizes are available in Gaur Cascades? The project offers apartments sized between 1020.0 sqft and 2175.0 sqft. 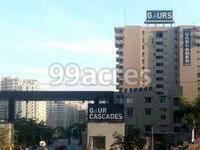 What is the area of 2 bhk in Gaur Cascades? The size of a 2BHK unit in the project ranges from 1020.0 sqft to 1355.0 sqft. What is the 3 bedroom size in Gaur Cascades? The area of 3BHK units in the project varies from 1530.0 sqft to 1750.0 sqft. How much is area of 4bhk in Gaur Cascades? The area of 4BHK units in the project varies from 2100.0 sqft to 2175.0 sqft. How much is the actual area of Gaur Cascades?The area of the project is 9.18 Acres. ecifications along with stressing on the customer's trust which has become the winning mantra for Gaurs. Gaurs Group foundation was laid in the year 1995 and since then the company has never looked back. Since its very first year, the company has been busy creating spaces that surpass international quality, architectural excellence and customer satisfaction. This journey has witnessed many successful milestones along the way. Some of them include providing dream homes to the discerning few and building remarkable infrastructure in the major parts of the NCR. The Group has been earning laurels through satisfying the expectations of thousands of customers and crafting brilliance with its architectural projects, ever since its inception in 1995. The trust of the customers has been one of the phenomenal factors in taking the group to new heights of consistent growth and development. Over the year, Gaurs Group has successfully delivered more than 35000 homes and Commercial Spaces. Some of the delivered residential projects are Gaur Green City, Gaur Heights, Gaur Green Avenue, Gaur Green Vista, Gaur Homes, Gaur Ganga, Gaur Grandeur, Gaur Global Village, Gaur Cascades, Gaur City and Crossing Republik. Gaur Central Mall at RDC Raj Nagar is one of the most sought after malls of Ghaziabad. Currently, we are developing the first and the biggest mall of Gr Noida West, Gaur City Mall. Today Gaurs Group has built a leadership position in major growth sectors of the Indian economy, including real estate, education, sports and healthcare. Gaurs Group has also been a crusader in the field of Green Construction and proactive with the concept of Solid Waste Management which helps them achieve the mission of Zero Garbage City in their township projects. Does Gaur Cascades offer facilities for senior citizens? Which is the nearest hospital? One of friend is looking 1180/1355 Sq/ft at Gaur Cacade, Raj Nagar Extension ( 3th floor or below) , can you suggest / share more about this project and if there are other better options in Raj Nagar..
Hi Ashwin ji, your friend can come to fortune residency. 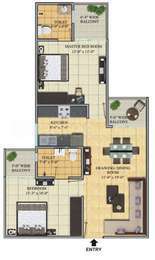 The best size for you would be 1375 sqft 3 BHK or you can see kw Srishti 1200+sqft size. Hi Ashwin, Gaur Cascades is a ready project which was completed in Oct 2015. The project is spread across 9.18 acres of land and features 9 towers with 15 floors and 1,140 units. As per your preference, you can get a new 1,180 sq ft apartment for around Rs 30 lakh whereas resale 1,180 sq ft will cost you in between Rs 38 lakh - Rs 50 lakh. You can also avail home loan from ICICI and HDFC Home Loan. Amenities available here include badminton court, jogging track, swimming pool, yoga/meditation area, RO system, video door security, rainwater harvesting system, and shopping center, among others. There is no dearth of social utilities. Some of the popular ones include Ghaziabad Bus Stand, Shivam Hospital, And Heart Centre, A.K Childern Academy, State Bank Of India, and The Yellow Chilli.